The 330ULT comes with 2 35BT/EX-503L body-pack mics along with the 330UPR receiver, packed in a carry case. Sound quality is great on this dual receiver system ..I would have really liked to have a nice "back of the camera" mounting arrangement as the receiver only has a cold shoe mount. Like my older Azdens I turn the standby switch to "audio" and cover it with tape so it can be never turned back to standby as I almost lost audio at a wedding cos the priest fiddled with my transmitter. 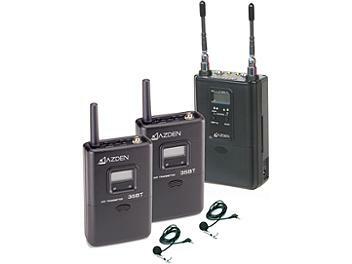 Love Azden quality and performance...A+++++ gear!! !